The overwhelming majority of Bulgarian folk music happens to be in odd meters–typically 5, 7, 9 and 11, with occasional combinations of those creating 13, 15, 17 and larger. Some musicologists have linked these odd meters to the history of the region’s languages–especially poetry–going back to Ancient Greece. Others connect them to dances, insofar as each odd time signature tends to be accompanied by a specific dance. Indeed, many odd metered song forms are named after such dances, for instance kopanitsa, which always implies 11/8. In fact, many accomplished folk musicians in Bulgaria could not tell you what the time signature of the music is; instead, they will refer to it in terms of its dance. The reason I feel compelled to share this information is twofold. On the one hand, Balkan music is becoming more and more prominent in the US. On the other hand, my command of odd meters has helped me greatly in assimilating difficult prog rock or contemporary classical pieces where odd meters are often used. Now to be fair–and, alas, to contradict the clever pun of my title–I prefer the term “irregular” instead of “odd,” because many Bulgarian rhythms are technically even, such as 8/8, 10/8, 12/8 or 22/8. However, within a given measure of these even time signatures, you would likely have beats of different lengths. The Bulgarian word for all of these rhythms would translate roughly as uneven-beat music. Think about the beats in a 6/8 measure (two dotted quarter notes) compared to that of a 3/4 measure (three quarter notes). If you are familiar with the melody from Westside Story, “I wanna live in America” (one measure of 6/8 followed by one measure of 3/4), imagine it as one long measure of 12/8. This is more akin to the beat ratios encountered in Balkan meters, where the dotted quarter beats co-exist with the quarter beats in the same measure in various combinations. To be clear, I am talking specifically about time signatures in which the denominator is 8 (or in some cases 16), but not 4. That is to say, the beat is not equal to the 8th note, but rather a group of 8th notes. In the west that phenomenon is typically expressed with time signatures of 6/8 or 12/8. Since Bulgarian time signatures are linked to dances, it is crucial that the music grooves. If this is the first time you’re attempting to feel or play Balkan odd meters, beware treating them as “missing a beat,” which is the most common Balkan groove killer I’ve encountered in the west. 7/8 is not 4/4 minus one eighth note! Imagine thinking of 3/4 as 4/4 minus one quarter note. I don’t think anyone will be waltzing to that. Moreover, if you are used to 4/4 (and the majority of westerners are), chances are your body will automatically revert back to it while playing, especially if you only allow yourself to count in terms of it. Balkan time signatures can also be understood as subdivisions of 2’s and 3’s. Native Bulgarian musicians don’t exactly think in these terms, but early Balkan musicologists found this to be an effective method of communicating the “uneven-beat” nature of Bulgarian folk music in western notation. And when Bela Bartok visited the region in the early twentieth-century, this way of notating the music became standard. In reality folk musicians in Bulgaria don’t think in terms of 2’s and 3’s, but in terms of short and long beats. The shortness and longness of beats may actually vary from village to village, so the subdivisions of 2’s and 3’s are approximations at best. But we encounter the same situation with swing music in which two 8th notes may be played closer to a dotted 8th and a 16th, or an 8th note triplet, but the actual interpretation is up to the musicians. So, the big questions: How short exactly is the short beat, and how long is the long beat? And how can one develop a sense of those lengths without resorting to counting? If you are a visual learner, picture each beat as either a square or rectangle. The square would equal two 8th notes, while the triangle would equal three 8th notes. And last but not least, clap along with the music: Clap your hands together for the short beats; clap your hands on a table or your lap for the long ones. Learn the melody, regardless of your instrument. A couple of years ago I taught my three American stepdaughters a childrens’ song from Bulgaria. They learned it quickly and without hesitation, despite that it was in 7/8. Most musicians and educators, by contrast, tend to want to analyze the meter beforehand. But if you can sing the melody already, learning the rhythm happens much more easily. Once you’ve internalized the pulse enough to follow along with the music, start thinking of 7/8 as a measure of three beats in which you have one long followed by two short beats. In Bulgaria this is referred to as the “male” version of the dance ruchenitsa, and is usually performed at a relatively slow tempo (also known as Macedonian ruchenitsa after the region it is most often heard in). 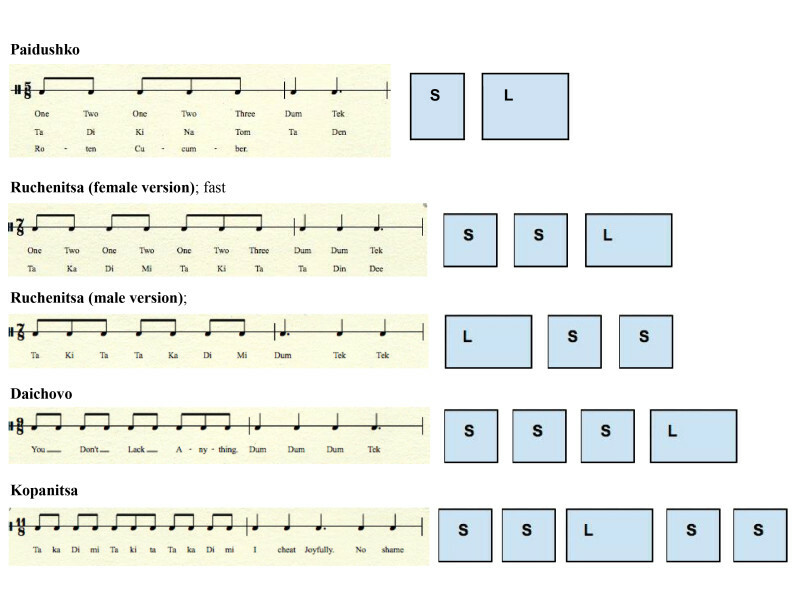 The “female” version is performed at faster tempos and has the reverse structure, with the two short beats preceding the long beat. In some cases it’s so fast that it sounds almost like a two beat cycle, where the first beat is four eighth notes long and the second is three eighth notes long. Obviously that changes the ratio between the beats, but that’s a tangent we won’t go into today. Curiously, you’ll never find a Bulgarian folksong version of 7/8 in which the long beat occurs between the two short beats (although some contemporary arrangements have started doing this). It may come as no surprise that there is no traditional dance associated with such a pattern. Similarly, a groove in 11/8 would be perceived as having 5 beats, where the middle beat is longer, thus creating a perfect symmetry. A good way to practice these grooves until they become second nature is to find some good recordings, make sure you know already what the time signature and subdivision is, and just clap along. Remember, the name of the dance will tip you on what the time signature is. Then move on to songs you don’t know and try to find the beats and clap along. See the accompanying table of the most common time signatures and subdivisions in Bulgarian folk music, including songs that demonstrate each clearly. I hope you find this useful and enjoyable. A widely respected performer, composer, and educator, Vessela Stoyanova is a triple threat on the Boston music scene. Born and raised in Bulgaria, much of her original music is inspired by the folk music of the Balkans. Her compositions have been recorded by numerous ensembles and performed at major Boston-area venues including the Berklee Performance Center, Jordan Hall, The Loeb Drama Center at the American Repertory Theater, as well as at many smaller venues around the U.S. and Europe.